Color-matching and stacking combos are the key to score really big points. 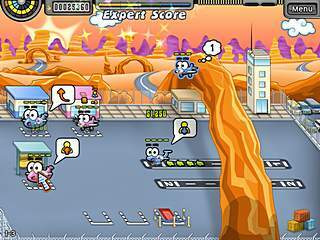 Though Airport Mania 2: Wild Trips lacks any sort of story the reviewers of many game portals including Gamezebo believe it to be one of the best time management games of the year 2010. And you'll have 99 levels to get convinced of that, not counting the tutorial and 16 extra levels that are provided in the premium edition. Despite the fact that Airport Mania 2: Wild Trips has one mode only, the replayability of the game is rather high as it depends on the possibility to achieve a better score. So here you go: there are 9 airports and your task is to set up the daily business in every of them, starting with one on the North Pole up to the Moon. Your job is to direct the planes to the runway or to the gates, to repair some of them and to fuel the others and don't forget about sending them to the luggage station and everything should be done as quickly as possible according to the rules of the time management genre. Note that every plane has its own color that specifies the type of aircraft it belongs to and determines how much money you will earn as well. As in the majority of the games of this genre color-matching and stacking combos are the key to score really big points. It means that the more planes you land consecutively, the bigger score you'll get, and the same applies to color-matching bonuses. 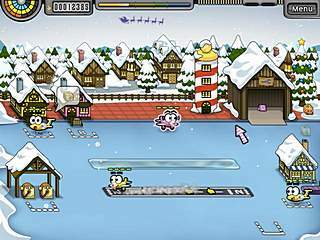 As for example, the more yellow planes you direct to the same gate, the higher the multiplier at this gate will rise. And here you'll face the shortcoming of Airport Mania 2: Wild Trips that actually is the only one in the game, as I believe. Some colors look so similar that it is really hard to tell certain types of planes apart sometimes. As a result it makes almost impossible to score the combos as much as you wish. Besides that fact makes some upgrades senseless. For example the difference between the colors blue and light blue cannot be noticed on the radar so that this helpful upgrade becomes quite ineffectual at times. Talking about the upgrades they truly affect the gameplay. And trust me the order of purchasing them is extremely important when it goes about the strategy. You can buy the radar that was mentioned before and that will help you telling the colors of the planes that are on their way to the airport or a station where the planes can be painted in other colors etc. Among the other merits of the game I'd like to underline the funny mini tasks that are special in every airport and the cute graphics. So if you have a spare minute just take a glimpse at the things going on around you such as rabbit that is running into the field only to have a hawk or some bird of prey swoop down and fly off with it. When you see such things you feel that the developers did a good job, don't you? As a conclusion I'd like to admit that both hectic pace and multiple goals make it accessible to not only the experienced players but also the beginners. So the game is worth playing all that 8 hours it might absorb you for! When I try to figure out my tgerat audience I try to profile friends or example customers. I could tgerat man, aged 26, works on the phone for an insurance company, has some breaks during the day where he can play games online, can't install software onto the corporate network, makes $25,000 a year, probably has a subscription with WOW and maybe another MMORPG, used to own a console but doesn't right now but like his buddies PS3, he has a conservative job so he wants a game where there is some release, doesn't mind violence, doesn't mnind sexuality, expects course language . From this profile I'd probably want a game that he can jump into, frag some monsters and jump out. He won't be playing five-hour quests with his buddies because he won't be able to coordinate breaks to meet up. Armed with a handful of profiles giving me different details I can focus the sort of game I want to deliver. Ideally, there are things the customer wants that I don't deliver so that I can keep those features in mind for the future, allow for them in the plan, even if I don't implement them right away.Mind you, I'm working on a casual game where my example profiles are women, aged 40 to 60, don't have the honed reflexes of the Nintendo generation, are constantly interrupted by the kids and home life, play to relax. It's really helped me pick the features I want to focus on and the features I want to drop. 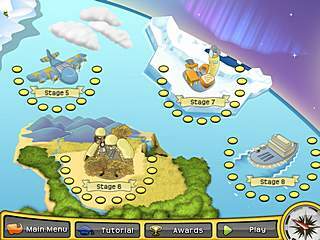 This is Airport Mania 2: Wild Trips review. Download this game here.